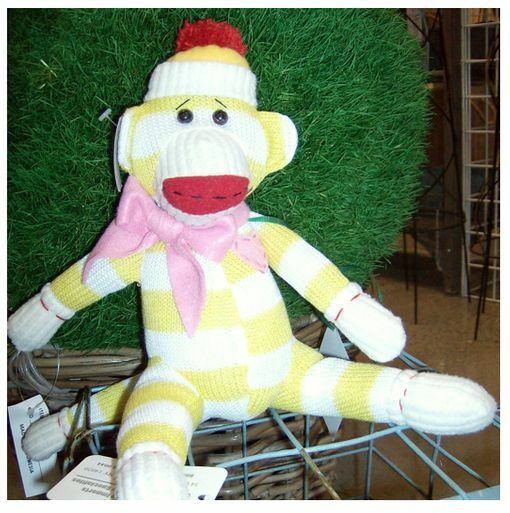 Home > Sale > Sock Monkey Doll - Daffy Dil 12"
Daffy Dil is a bright daffodil yellow and white striped 12 inch knot sock monkey. Daffy Dil wears a matching cap with a red pom pom and a pink bow around her neck. She has a pink bow around her neck and a pink felt heart. This adorable Sock Monkey will brighten up your day. NOTE: Button Eyes - possible Choking Hazard. Appropriate for only for ages 12 and up. This plush is best suited for decoration, and not small children.